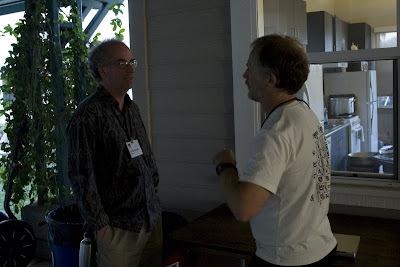 I just got back from Foo Camp 2009, which was a blast as usual. I think this is my third or fourth Foo Camp, and the energy around public uses of technology was palpable. It's structured as an unconference, where the 300 or so folks showing up design the conference program of roughly 70 sessions in about an hour the first night. 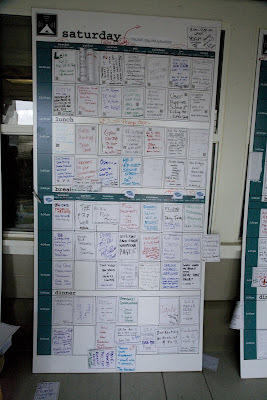 The picture above has the schedule for just one half of the rooms/tents on Saturday! 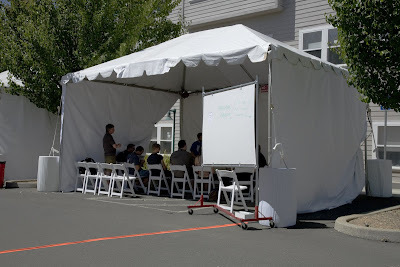 If you don't move fast and claim a conference room, your session will be in a row of tents in the parking lot. This actually works out fine, but don't expect to be doing PowerPoint out there! Many cool people attend, and the quality of the conversations is terrific. These are all folks who believe in technology and have a certain level of common language and understanding (even though the range of people is pretty amazing). That's why conversations can cut right to the issue that people are debating. As one attendee put it to me, he can always go to everyone's blog and find out what they're working on. But, to engage in a realtime conversation with them is completely different. I did a session on technology that does social good but doesn't make money, and got a dynamic group to show up. There were people already doing cool stuff, like InSTEDD and some great work around mashups of humanitarian data in Afghanistan, as well as folks discussing lauching cool new social enterprises (but we can't talk about them yet). One sample session was the one on the Google Book Settlement, led by Pam Samuelson of UC Berkeley. Brewster Kahle of the Internet Archive ( a forceful critic of the settlement), Tim O'Reilly, Marissa Mayer of Google were all part of the audience. The conversations were passionate, while Samuelson worked to explain many of the salient points of the settlement. The conversation went 20 minutes overtime, and then spilled out into the corridor outside (see picture of Brewster and Tim talking above). My small contribution to the discussion was (of course) on accessibility. A significant slice of the settlement agreement is on the topic of access to Google Books by people with print disabilities. My understanding is that this was very important to the University of Michigan, one of the key libraries at the center of the Google Book project. The exciting thing is that Google committed to accessibility of these books for people with print disabilities on a par with what people without disabilities get. And Google made this parity commitment before other key players. For example, the National Federation of the Blind has either sued or threatened to sue the Author's Guild (one of the plaintiffs in the lawsuit against Google) and Amazon over their failure to provide for accessibility (in the famous soundproofing of books controversy, as well as the inaccessibility of Amazon's Kindle to the blind). Because of this commitment, the disability advocacy groups I know about are actively supporting the settlement as a victory for disability rights. And yes, it actually is a camp. The lawn outside the buildings (and the orchard behind the lawn) is covered with tents. I actually slept really well, considering I went to sleep between 230 and 330 am both nights I was there. The first session isn't until 10 am in deference to the geeks staying up all night playing werewolf ( a role playing game which is incredibly addictive)!